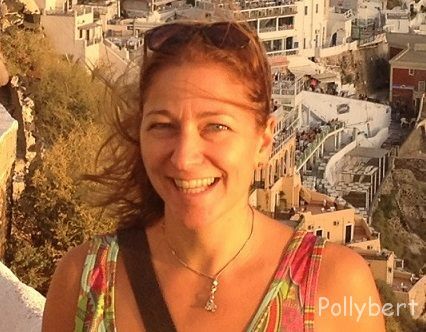 Recently I got an email from a reader complimenting my blog (just love that!) which also included a breakfast recommendation. So shortly after I decided to give the suggestion a try and booked a table at the Salon Plafond. The reservation wasn’t really necessary. At 10:30 on a rainy Saturday morning the place was quite empty. I loved the ambience, the room itself is so beautiful and the furniture comfortable. It all invites to stay for a while. Of course when the menu offers Eggs Benedict then this is my prefered breakfast. Unfortunately it is not really good at Salon Plafond. Also a mix of Eggs Benedict and Eggs Florentine is not available. 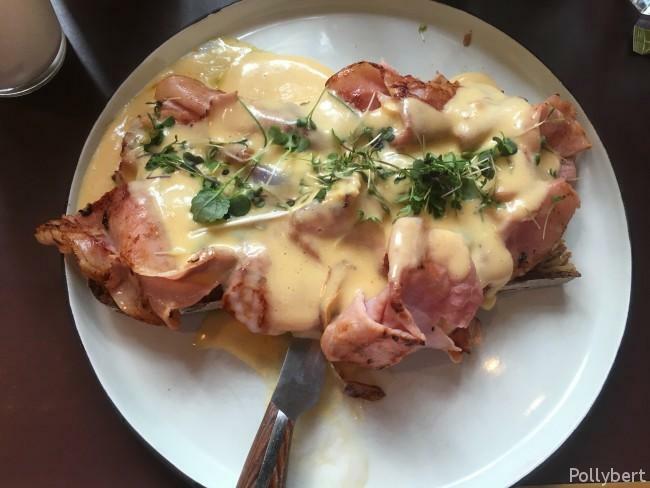 The eggs come here served on a large slice of bread which is covered with grilled ham, the two eggs and sauce Hollandaise on top. And this is how they look at Salon Plafond. If you are searching for the eggs, you are not alone. I did the same. Finally I identified the gibberish stuff on the left side of the bread as uncooked egg white. Where exactly the egg yolk hid, I have no idea. The waiter took the complaint in stride and in no time I had a new serving of the eggs in front of me. Especially after I criticized the uncooked egg white I was looking forward to how it was executed the second time. I have to say it was an ingenious solution since the egg white seemed to be missing at all. True, that might be unfair. There was a bit of egg white with one of the eggs, but the second one consisted only of the yolk. Overall the eggs were okay. Personally I don’t like the ham grilled. 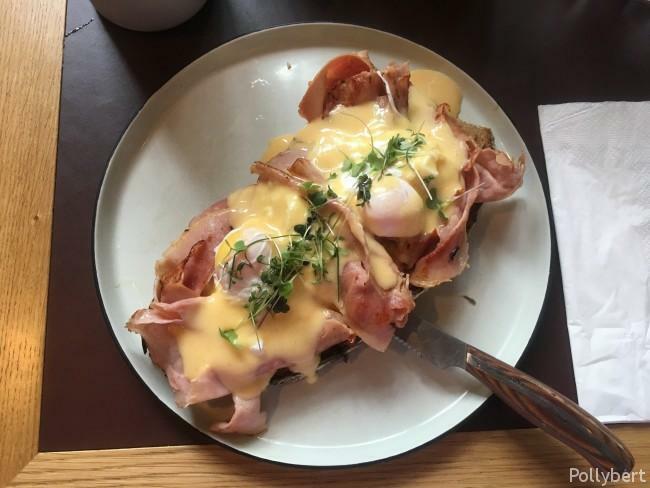 And I rather have a brioche underneath instead of dark bread (which can be absolutely fabulous though as seen in Copenhagen). No, these eggs don’t entice me to come again. 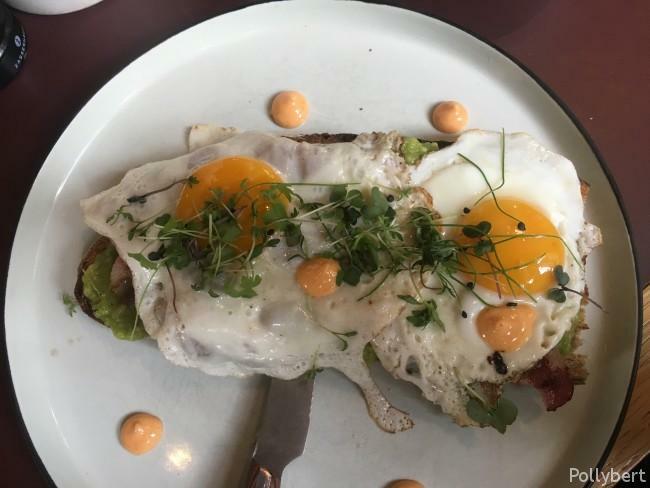 My friend fared better with her order of ‘Love shock’ which consisted of the same bread but with avocado, crispy bacon and topped with two fried eggs. The chili mayonnaise gave it the right kick. 1. 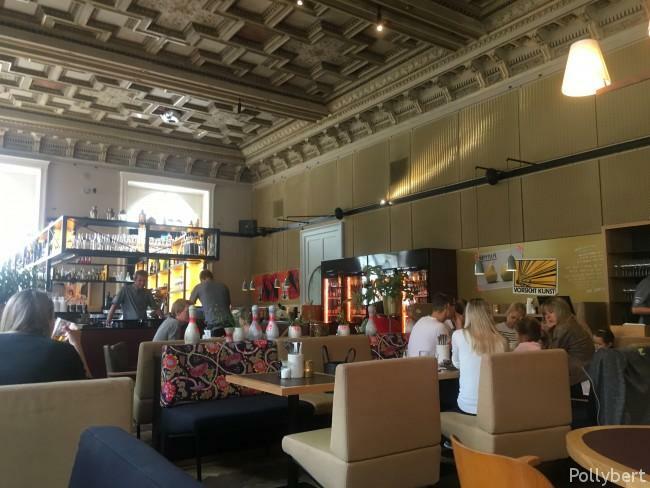 Bezirk, Austria, breakfast, dining in Austria, eating out with friends, eggs benedict, restaurant review, Vienna, Wien. Bookmark.